A couple miles east of Weingarten Vineyard lies the winery’s namesake, the town of Weingarten, Missouri. With roots deep in German history, the town is named after a church in the “Old Country” called Weingarten Pfarrkirche (meaning Wine Garden Parish Church). This church still stands today, and is located in the familiar Black Forest region of the German state Baden-Wὓrttemberg. Many of the immigrants to Ste. Genevieve County and Weingarten came from this region and the Offenburg, Germany area. Early Germans settled in Ste. Genevieve by the 1830’s and 1840’s. As land continued to fill, these farmers slowly made their way up the Mississippi, then began looking to the west. By 1840, the towns of New Offenburg and Weingarten were settled. As the population grew, the need arose for a church, and in 1845, a church known to the early immigrants as the Church of the German Settlement (current day St. Joseph’s) was constructed in the town of Zell. The settlers traveled great distances on horseback or foot, sometimes 15 to 20 miles, to worship. By 1850, plans were developing to build a plank road from the lead mines to Ste. Genevieve. This would provide an improved route for farmers to bring crops and supplies to shipping points along the Mississippi. Rights-of-way were purchased and farmers were given deeds to use the road for free in order to carry farm products to and from Ste. Genevieve. As the area continued to develop, it saw an even greater influx of immigrants. 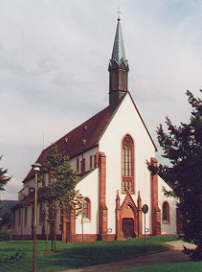 The Church of the German Settlement in Zell soon proved too small for the number of families, and a proposal to build another church was rapidly gaining support. 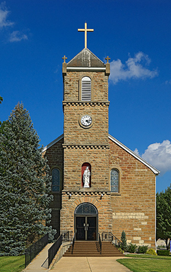 Groundbreaking on a new building occurred in April 1872 and construction on the Our Lady Help of Christians Church in the village of Weingarten was soon underway. It remains an active Catholic Church today. By 1900, a railroad was in the works which was built parallel to the Plank Road. Completed in 1903, it gave all the towns along its route an economic boost. Stores and houses sprang up, while all the towns, including Zell, Weingarten, New Offenburg, Sprott, Miller’s Switch, and Murphy’s Landing raced to build new depots. Transportation became quicker and easier as the train shuttled travelers to and from these stops, while also delivering mail directly to the stations. Occasionally families would enjoy “Sunday Excursions” on the train, riding to Bismarck then transferring to the main line and making a jaunt up to St. Louis. As a new member of the Weingarten community, we at Weingarten Vineyard like to think about the smiles and excitement of the families making that special trip to St. Louis as we drive across the wooden railroad bridge and into our vineyard each day. We think about the early immigrants who traveled from Germany, not knowing what was in store for them, but on the promise of a better future. They saw, as we have seen, the beauty of Ste. Genevieve County and the desire to call it a new home. We think about the early farmers and their back-breaking struggles on the land, all the while knowing their toils would benefit their children and grandchildren. Finally, we would not only like to honor the rich history of the area, but, as we envision that train slowly chugging by our vineyard, offer a nostalgic tip of the hat to all those who paved the way.